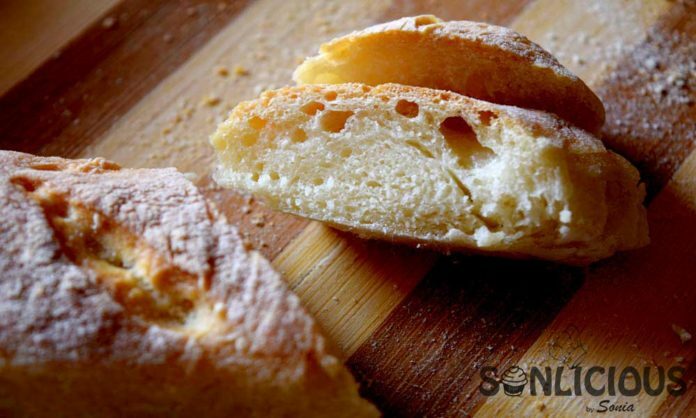 French Bread Baguette is a long narrow loaf, which can be easily distinguished by its length and crispy crust. Before 1920, the word Baguette was not referred to as bread. This word is derived from the Italian word “bacchetta”, means wand or stick. The baguette is either a relatively single serving size or cut from a longer loaf. It is often used for sandwiches. French gives credit to August Zang, an Austrian Officer, who brought the first steam oven in France and introduced Vienna bread. In the United States, Baguette will generally be kept fluffy from the inside, like sandwich bread. The crust will be crispy and are sometimes split in half to make French bread pizza. The Baguette is made from Flour, Yeast, Water, and Salt. It does not contain any additives. The baguette is generally formed with the series of folds and rolling motions. Traditional baguettes are 24 to 30 inches long. It is baked either directly on the hearth of a deck oven or in special perforated pans. A deck oven is a combination of a gas-fired traditional oven and Brick Oven. Deck oven uses steam injection to make a proper baguette. The steam helps the crust to expand before setting and helps to make a perfect crust. The French Bread Baguette is also made with other dough outside France. Like in America, they make Baguette with multigrain flour, Whole wheat flour or sourdough. In Vietnam, They add rice flour to the dough. A perfect baguette is crusty from outside, light and fluffy from inside. Though it is difficult to make perfect Baguette at home, the version I have shared in my recipe is much closer to the Artisan bakery version. Hand rolled Baguette are generally termed as traditional Baguettes and are made in a traditional French way. Authentic French Baguettes recipes produce dark and crisp Baguette. Hand rolled baguettes are always the best to have. There are Baguettes Baking Pan available online that helps in getting a good shape of your hand-rolled Baguettes. Machine made baguettes are usually much longer, uniform in shape, lesser crispy crust and cheaper. Patience is the only word that can help you to get a perfect baguette. Even if you don’t get a perfect baguette for the first time, just don’t give up. I failed in my first few attempts but I was persistent. With your attempts you will understand what will work best in your environment and with practice, you will easily get the perfect one. This bread recipe is quite easy but you only need to plan for it as it will be an all-day task. 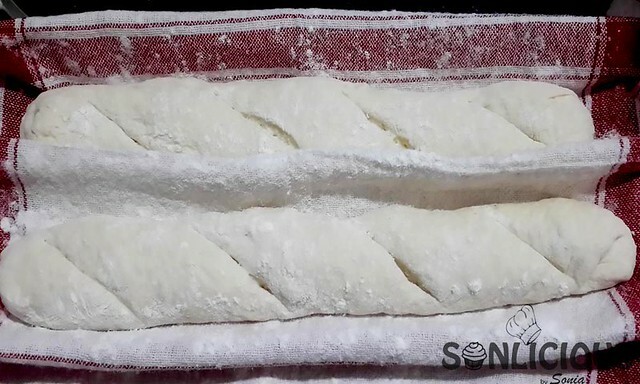 It doesn’t mean you will work on bread for the whole day but it simply involves rise and fold again and again. Don’t forget to keep Ice or water in the oven while baking a baguette. It will help to create steam while baking. The sound of French Bread Baguette is extremely different. If you tap the bottom of the Baguette and you get a hollow sound, your Baguette is absolutely ready. The cutting sound of Baguette is also different. You need Bread Knife to cut a Baguette Check the video to listen to the Baguette Bread cutting sound. 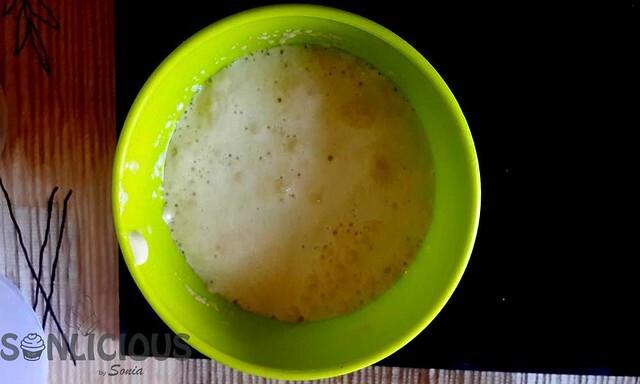 In a bowl take 20 ml lukewarm water. Add sugar and yeast to it. Dissolve it and keep it aside until it froths. In a large mixing bowl, add flour, salt, and activated yeast. Now add 200 ml water and gently mix it for 5 minutes to make a slightly sticky rough dough. Place this dough in a lightly greased box and cover it with cling wrap. Refrigerate the dough overnight (Approximately for 10 hrs). Take out the dough and gently press it to form a rectangle. 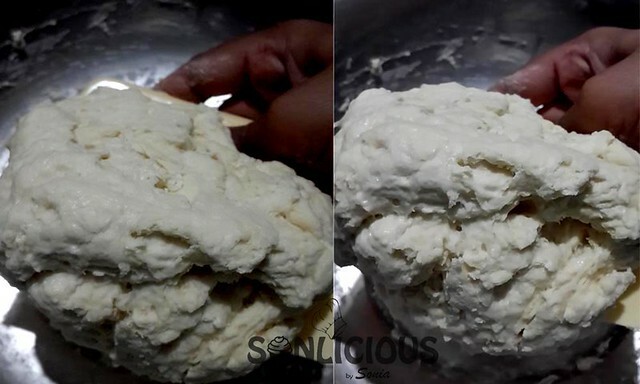 Don’t punch the dough, handle it gently so you can keep as much air in the dough as possible. Now fold each side towards the middle, like an envelope. Again cover the dough with cling wrap and keep it aside for 45 minutes. For reference check the video above. After 45 minutes repeat the same process as described in step 4 and keep the dough for another 45 minutes. Now take out the dough on lightly floured surface. 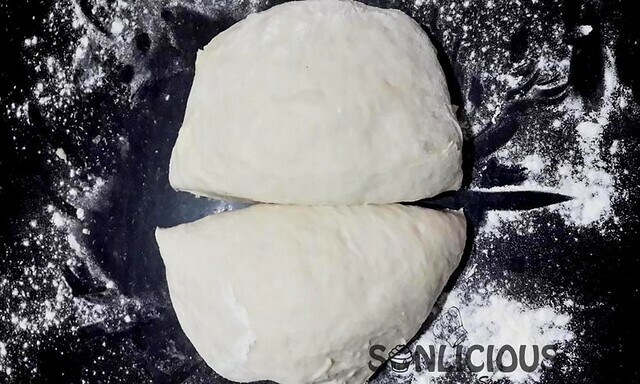 Divide the dough into two equal parts. 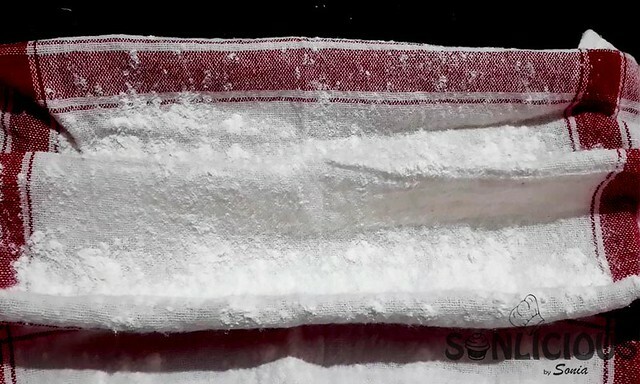 Now on a baking tray, by using a kitchen towel, make two different molds and dust each with flour. Place shaped logs on it and let it rest for 30 minutes. Meanwhile, preheat your oven to 220 degree Celsius for 10 minutes. 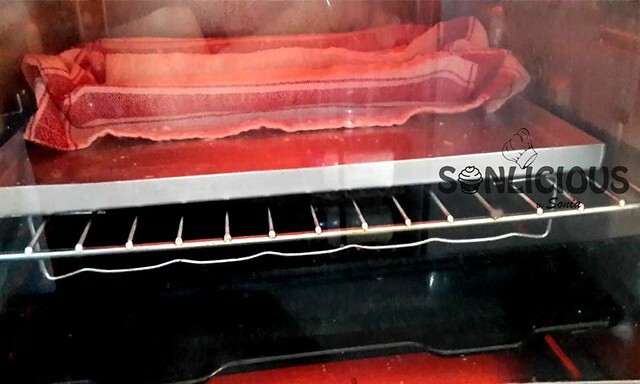 Keep a tray filled with water on bottom rack in Oven to create steam. Once shaped log doubles in volume, sprinkle some flour on it and slash each to 4 times along its length diagonally using a sharp blade or knife. I used a paper cutter for this. Keep this tray on the middle rack of the preheated oven and continue to bake at 220 degree Celsius for 40 minutes or until Baguettes are Golden Brown. Once done, take out your French Bread Baguette out of the oven and keep on a wire rack to cool. 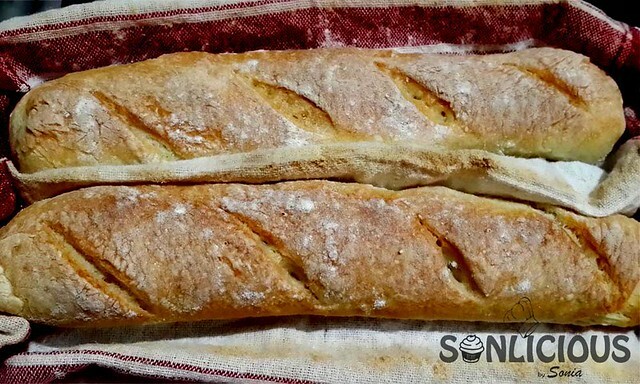 French Bread Baguette is a traditional long narrow bread that has dark crisp outer and soft fluffy inside. It is often used for sandwiches. In a large mixing bowl, add flour, salt and activated yeast. Now add 200 ml water and gently mix it for 5 minutes to make a slightly sticky rough dough. Place this dough in a slightly greased box and cover it with cling wrap. Refrigerate the dough overnight (Approximately for 10 hrs). After 45 minute Repeat the same process as described in step 4 and keep the dough for another 45 minutes. Now on a baking tray, by using kitchen towel, make two different moulds and dust each with flour. Meanwhile preheat your oven at 220 degree Celsius for 10 minutes. Keep a tray filled with water on bottom rack in Oven to create steam. Once shaped log doubles in volume, sprinkle some flour on it and slash each to 4 times along its length diagonally using a sharp blade or knife. I used paper cutter for this. Keep this tray on middle rack of the preheated oven and continue to bake at 220 degree Celsius for 40 minutes or until Baguettes are Golden Brown. Once done, Take out Baguettes out of oven and keep on a wire rack to cool. If you need to store your Baguettes, the best way is to wrap them in aluminium foil and freeze them. When you need to eat your frozen Baguette, you can put your Baguette in oven at 180 degree Celsius for 10-15 minutes with the foil and then take off the foil and keep it in the warm switched off oven for about 5 more minutes to get the crisp back. 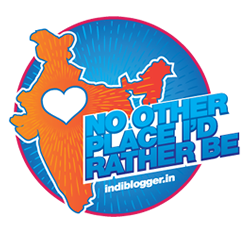 Shilpi this recipe is in written form only. Can I replace with instant or dry yeast as recommended invyour other recipes?